Nobody seems to know for certain when the first brass band appeared in the towns and villages around modern Milton Keynes, but band activity in the area is documented from around 1830. Looking at the influx of people from Yorkshire, Wales, Scotland and Ireland coming to work for the extension of the Birmingham line to London in 1833, it is not surprising that the brass bands developed so distinctively in this area. Few people know that Wolverton Town Band has its origins in the old 1st Buckinghamshire Volunteer Rifles. The Bandmaster was Harry Brooks and among the musicians was a Joe Lovesey, whose son went on to form the locally famous dance band of the second world war years. Due to the new Liberal Goverment of 1906 and its changes, the Territorial & Reserve Army came into being. In 1908 the Rifles band was disbanded and the Territorial Army took over. 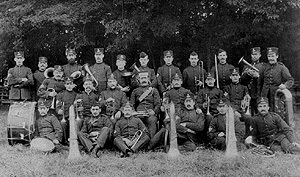 A breakaway group was formed by three members of the Rifles band, Fred Grace, Jack Bates and a Mr. Carvell, and this group eventually became the Wolverton Town Band. Mr. Dave Baker remembered when the first instruments were handed out in the organ loft, as it was then called, at the rear of the North Western Hotel. In the loft was the old organ belonging to a Mr. Harper that was formerly in St. Georges Church. He was only 13 years old then. In 1920 the band entered the National Brass Festival at Crystal Palace in the 4th section with the test piece "Il Trovatore' by Verdi. They gained 3rd place amongst 25 bands competing. In 1922 they again came third, this time in the 2nd section. Being immensely proud of their band the people of Wolverton presented every band member with a medal, which they paid for themselves. During World War two the band had to stand down as men were called up. Players and instruments became part of the Local Defence Volunteer Band. In 1940 the Wolverton Home Guard Military Band was formed, with Doug Dytham as Bandmaster. It was a very unique band, being the only Home Guard Band in the country. After leading the Stand-down parade through Wolverton at the head of the Battalion in December 1944 the band passed into history.